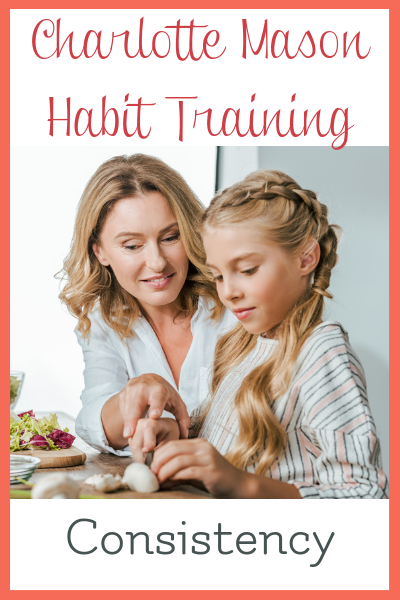 If you are homeschooling Mom using the Charlotte Mason philosophy, the ultimate goal of cultivating your children’s character is instilling good habits. As homeschooling parents, it is our responsibility to ensure we are consistent with disciplining our children. And, consistency with Charlotte Mason training is key to its success. The definition of consistency is the conformity in the application of something, or in other words, gaining stability and steadiness. Are we consistent with training our children in the formative years? It’s imperative that we build uniformity in the home. It creates trust, grows confidence, and life long habits in our kids and future generations to come. Charlotte’s approach to education is wrapped up in one compelling and concise sentence: Education is an Atmosphere, a Discipline, a Life. Let’s dissect Education is a Discipline and how our consistency efforts affect the achievement of training our children with godly character and positive habits. As we teach our children these defining characteristics, we must not approach them as daily routines –like dental hygiene, making the bed, and doing chores. Instead, teaching character traits consistently is even more important — it changes the heart of a child. Some spiritual attributes may include, but are not limited to, cultivating a servant’s heart, developing honesty, and generating reliability. What qualities would you like to see your kids develop? Write them on paper and focus on one habit at a time each month as Charlotte Mason recommends. Jot them down on a monthly calendar that you see every day to remind you. Frustration can set in quickly if you try to tackle them all at once! For ideas on forming new habits routinely, you may want to try reading Charlotte Mason’s books Charlotte Mason’s riginal Homeschooling Series by Charlotte Mason or Habits: The Mother’s Secret to Success by Charlotte Mason and Deborah Taylor-Hough. As parents, we must always be a good example in front of our kids. For example, do we respond appropriately to our spouse when we disagree with a statement he/she made? Your kids will mimic that same type of responses as well, whether good or bad. I remember a light bulb moment when my daughter became stressed quickly and her words sounded just like me — frustrated and stressed over a simple mishap! I quickly apologized and asked her if we could work on learning to give others grace! It has made a huge impact on our relationship and homeschool day! As teachers, are we displaying impatience with our kids when teaching the same concept repeatedly but are puzzled when we see the same lack of restraint in them? Let’s be consistent with training our children in the way they should go, starting with ourselves. You can find excellent resources that will help you learn and teach better spiritual habits. 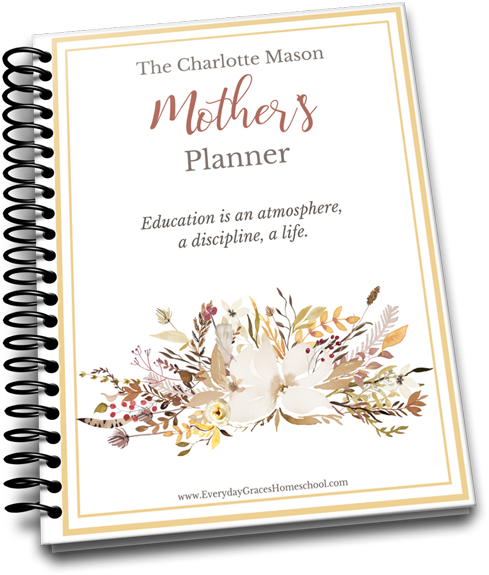 In fact, you’ll be encouraged and equipped with your own FREE Charlotte Mason Mother’s Planner. Simply put, it’s a Charlotte Mason training guide for Mothers. If you’d like to find out more or how Charlotte Mason afternoon schedules work for wearisome mothers, check out Everyday Grace’s article on Afternoon Occupations! Some examples of moral qualities to practice may include like love, joy, peace, patience, kindness, goodness, faithfulness, gentleness, and self-control. Try Everyday Grace’s Fruits of the Spirit Scripture Study for an in-depth study of these spiritual fruits. Or, do you have a child who is stubborn but has leadership qualities? Shape those God-given talents into God-honoring skills by trying this free Charlotte Mason habit training guide on biblical leadership for kids. When you see a bad habit forming in one of your children, take the time and gently correct it right away. If it’s a struggle for you as well, don’t ignore either. Instead, devote your time to work on it together. And, be open and honest with your own inconsistencies. Your children will learn the value of truthfulness and vulnerability and may even confess their own struggles someday. Great habits are powerful tools in shaping your child’s character. Charlotte Mason referred to them as railroad tracks — parents lay these down for their own children’s lives. We must lay down wholesome and pure pathways to spiritual success. Which means we also must be diligent and persistent in nipping those ugly habits in the bud! Consistency is key for developing good patterns of moral character. Using Charlotte Mason Principles as your training guide, it will give your family the confidence and clarity they need for a successful home and spiritual environment. What habits have your children formed, good or bad that you’d like to devote your time in shaping? What would you like to cultivate in your own life? Write in the comments below!